What Is Exhaust Leak Repair? When Should You Have an Exhaust Leak Repair Done? Exhaust leak repair should take anywhere from two to three hours to complete. In some cars, it may take a lot less time, while others are going to take more. It just depends on how difficult it is to get to the exhaust manifold. Expect to pay anywhere from $125-$300 for labor costs. The parts aren’t going to cost much either. While different vehicles require parts of differing prices, the range is somewhere between $15 and $50. If you get the work done at your dealership, you can expect to pay more, but you may also get better quality parts and service. The cost of having an exhaust leak repaired will vary depending on the type of car you drive. Some manufacturers charge more for the parts than others, which can cause the price to fluctuate. Different garages will also have their own hourly rate for labor, but the average you can expect to pay at some of the major chains is below. If your exhaust manifold starts to leak, it can cause severe damage to your car. Taking too long to fix it can mean a much higher repair bill than if you took care of the problem right away. While this is a fairly simple repair to perform, it does take some tools that not every may have. Some vehicles may have a more complicated process for repairs of this nature than others do. The immediate benefit of repairing an exhaust leak is that you are stopping serious problems in their tracks. If that exhaust starts to cause a burned gas valve, as it will if it is allowed to continue to leak, then you can damage the intake manifold. This happens because the combustion chambers exhaust begins leaking out in the wrong direction and it starts to flow directly into the intake manifold. So if you wait too long to fix this problem, then you could be looking at major repairs. That’s why it is so important to resolve this problem as soon as you know about it. You should have the repair done as soon as you notice the problem. This may not be something that your mechanic will notice when you take your car for a regular checkup, but you can watch for the signs yourself as you drive. One of the most common signs is that the engine will make more noise than usual. Now your mechanic may not notice that, as they don’t have any experience listening to your engine under normal circumstances, so they may not realize a louder than usual sound. It will be up to you to pay attention to the warning signs. You should also watch out for a vibrating gas pedal. If you start to feel it rumbling under your feet as you drive, then you may have an exhaust leak to blame. The third way you can detect this kind of problem is by noticing a drop in your miles per gallon. The leak into the combustion engine will probably throw off the gas sensor. That can mean that your car will not be using fuel very efficiently. If you notice any of these things happening with your car, then you need to get it checked out immediately. If you have an exhaust leak, you do not want it to persist. If you suspect an exhaust leak and take your vehicle to the mechanic, they will start by performing a visual inspection. They want to be sure that they are identifying the problem correctly, but they won’t be touching your vehicle for a while. 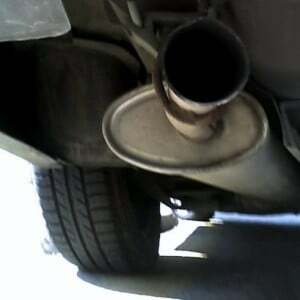 That’s because the exhaust becomes one of the hottest parts of the car after it has been running for a while. 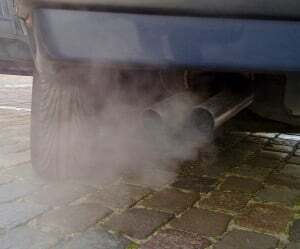 It’s a bad idea to even touch the exhaust and surrounding parts until at least a few hours after the vehicle has stopped running. The mechanic is going to look for exactly where the problem lies. It could be along any part of the exhaust manifold, which is a long series of connecting pipes and parts that run much of the length of the vehicle. The problem could be on any part of this apparatus, and finding the right place is key to fixing the problem. The leak will usually be caused by a hole or crack, and the mechanic is going to have to bring out welding tools to provide the best fix. A quick fix can be made with some sort of sealant, but this is usually a temporary solution. At some point, the manifold will need to be welded for a true fix. Because the exhaust manifold is in a few separate but connected parts, it may be possible to just remove and replace the affected part. This will usually involve taking out some screws and bolts and just attaching the new piece in. But the mechanic will need to inspect the entire manifold apparatus to ensure that there are no further problems. For those trying to do the repairs on their own, replacing an entire section is usually the easiest way to go. If you really want to cut your costs on this repair, then you ought to try to do it yourself. It’s not terribly complicated, and with a few inexpensive tools, it can be done reasonably fast. If you buy the parts yourself and install it on your own, you can be looking at getting the entire repair performed in under $30. If it seems like too much work for you to handle on your own or you are just unsure if you want to perform this kind of repair for yourself, you can always buy the parts you need for and take them to your mechanic for the repair. Not all mechanics will allow this, and dealers most definitely will not, but if you can find a mechanic who will let you buy your own parts, you may be able to save a decent amount of money. Below are some sample prices for exhaust leak repair for some of the most popular cars in the USA. While there will be a difference for different garages, you should get an idea of the cost of repair for your brand of car.